This week's episode of the Fantastic Films of Vincent Price takes a look at the 1970 film SCREAM AND SCREAM AGAIN, as well as the made for TV special AN EVENING WITH EDGAR ALLAN POE. Here's one from the vaults - a Thanksgiving episode of Chiller Cinema from 2000. Doc Gangrene and Nurse Deadbody invite two special guests - a zombie pilgrim and a zombie Indian - into the lab for a Thanksgiving feast.My dog Buster makes an appearance in this one too, when he was just a pup (he's 16 now). I've gotten a lot of requests for these older episodes over the years, and will break more out if you guys want, just let me know. Happy Thanksgiving everyone! Dr. Gangrene serves up the perfect Thanksgiving treat to enjoy for the holiday - Blood Freak, 1972, a turkey so inept it must be seen to be believed. A man becomes mutated into a half-man/half-turkey blood thirsty killer! 1. extreme or irrational fear of cats. 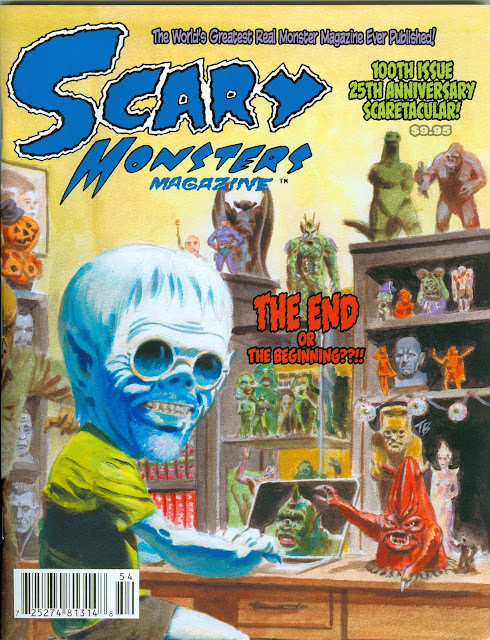 I had the pleasure of making another guest appearance on Monster Kid radio recently with my good friend Derek Koch to discuss the 1977 anthology film, THE UNCANNY. CLICK HERE TO LISTEN/DOWNLOAD THE EPISODE. This is a pretty fun film featuring three short stories and a wrap-around segment all centered around the theme of cats. Not the best anthology of all-time, but not the worst either. It's definitely one of the more interesting though, in that all of the stories are wrapped around that one theme - cats. It stars Peter Cushing, Donald Pleasance, and Ray Milland - which is a pretty stellar cast, when you think of it. Made in 1977 - which means Cushing would have appeared in both this and STAR WARS the same year. It was directed by Dennis Heroux. This film feels like an Amicus anthology film like DR. TERROR'S HOUSE OF HORRORS, THE HOUSE THAT DRIPPED BLOOD, TALES FROM THE CRYPT, etc. but it in fact is not an Amicus film. It was in fact produced by Amicus co-founder Milton Subotsky for Montreal’s ASTRAL FILMS and distributed by THE RANK ORGANIZATION (who also did VAMPIRE CIRCUS 1972, COUNTESS DRACULA 1971, and TWINS OF EVIL 1971), making it a British/Canadian co-production. We go in-depth discussing the film and the individual segments, and the episode turned out great. 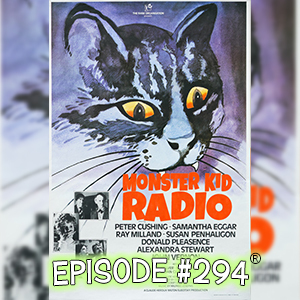 I mention an issue of WEIRD TALES Magazine in this episode, as it had a cat story that featured a very similar (exact) punch line as one of the segments of this movie. The story was by Robert bloch, and called CATNIP. 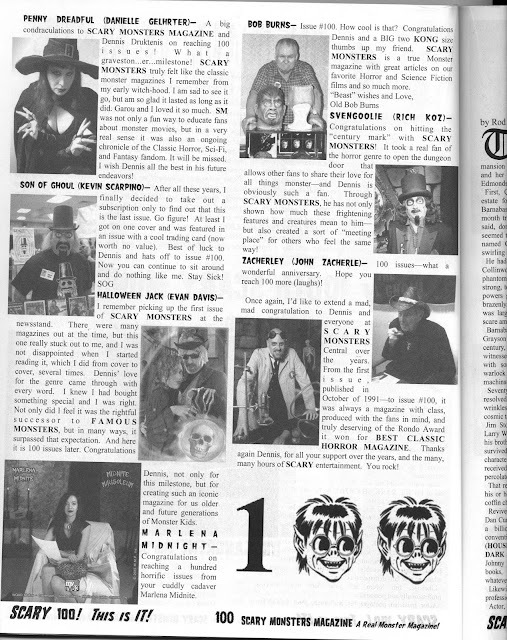 That issue of Weird Tales is available for download on Archive.org and features stories from some AMAZING writers such as Robert Bloch, Ray Bradbury, Manley Wade Wellman, Algernon Blackwood, Theodore Sturgeon, Clark Ashton Smith, H.P. Lovecraft, August Derleth, and Edmund Hamilton - all in one issue!! YOU CAN DOWNLOAD IT HERE - WEIRD TALES MARCH 1948. The movie is available on Region 2 DVD through Amazon, and really needs a proper US release. 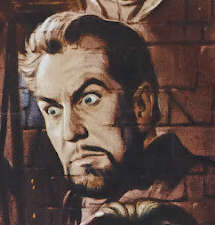 I just posted a new video this weekend collecting all of my reviews of Vincent Price's films of the 1950s. This was a fun decade for his films, as he appeared in some TERRIFIC movies, such as HOUSE OF WAX, THE FLY, and the William Castle films. 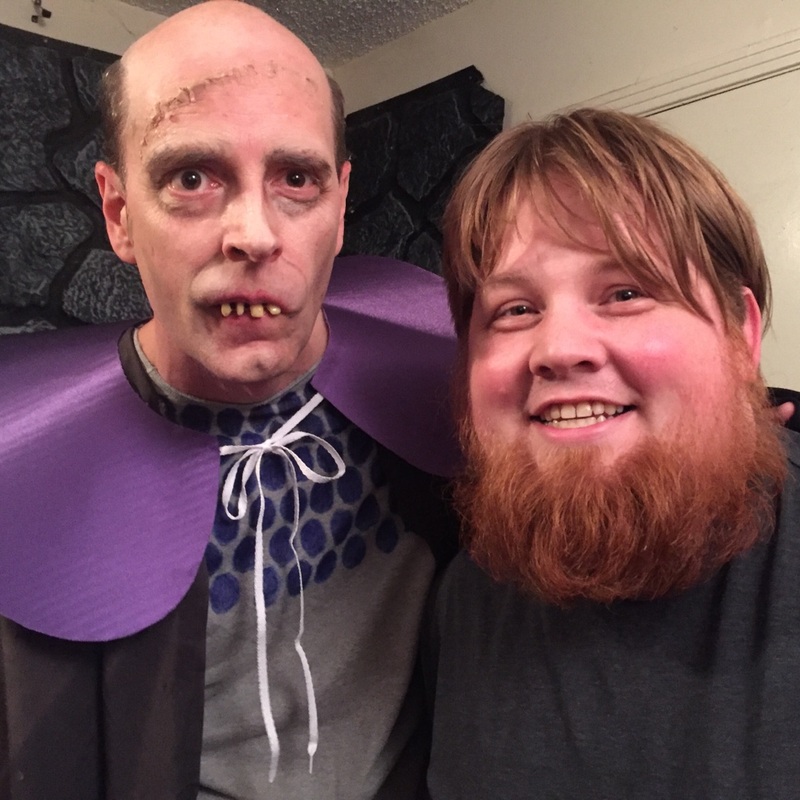 Last night I got together with Cameron McCasland and Chuck Angell and filmed a cameo for the upcoming short film Retrieval Service, directed by Cameron and based on my own short story of the same name. 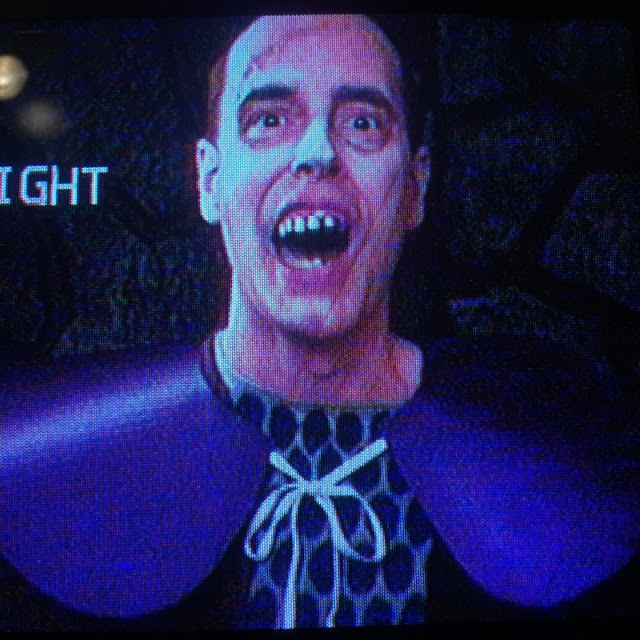 In this scene I will be paying homage to Nashville's best known TV horror host, Sir Cecil Creape, (Russ McCown). Chuck did a spot-on job replicating Sir Cecil's makeup, and I had a blast playing my own idol and inspiration, if even for such a brief appearance. 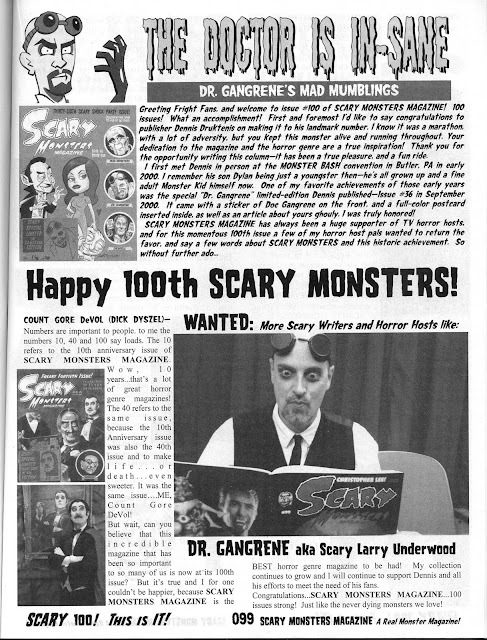 fun stuff, I thought I'd share it with you folks here - look for the film to start making the rounds sometime in the next few months, and be collected into an anthology hosted by Dr. Gangrene in 2017. The long-standing Nashville bookstore BOOKMAN/BOOKWOMAN is closing at the end of the year. I HATE to see another Nashville landmark fade away. I'm still reeling from the loss of the downtown GREAT ESCAPE, my favorite hangout growing up. 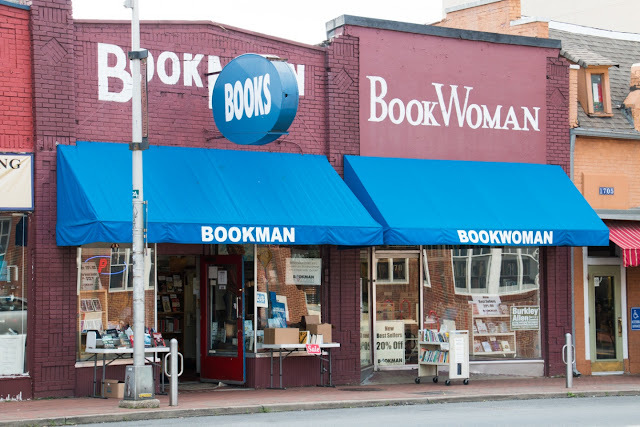 Now Bookman, which has been in business for 20 years in its Hillsboro Village location, is closing. I stopped by there yesterday and picked up a stack of used books - all at 50% off. I spoke with owner Larry Woods, who told me that the property owners are raising his rent 400%. FOUR HUNDRED PERCENT! You know what that means? It means they want to force him out, which is exactly what has happened. Larry said they considered moving into one half of the store, which currently occupies two buildings, but they ran the numbers and it just doesn't work. No kidding. BUT, on the flip side of this story, in an article that ran in the TENNESEAN Newspaper yesterday, the owners of the building, Davis Cutlery, claim they did NOT raise the rent, and offered to let them stay there at the current rent. So who is telling the truth here? Something is not being reported in this story, it seems. I do know one thing for sure though. The face of Nashville is changing rapidly, and I don't like it one bit. Everywhere you look there are shops closing, buildings being torn down, and apartments going up at an alarming rate. People are flooding into Nashville as it has become an "it" city, and the flavor that made it so great is rapidly evaporating. As a lifelong Nashvillian, born and raised here, I hate to see where it's headed. 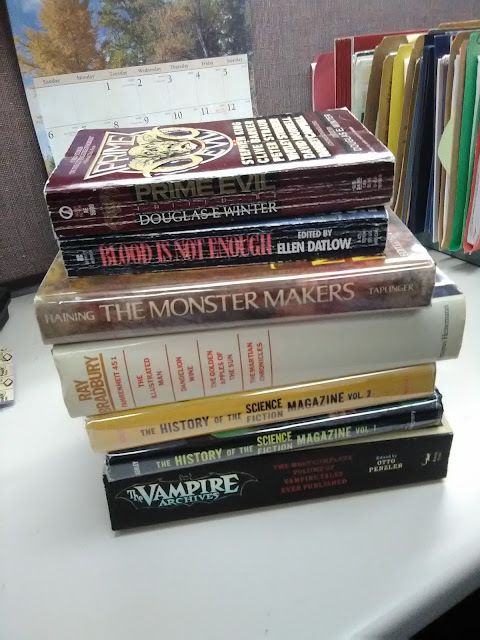 I picked up a pair of paperback books recently that I wanted to share with you ghouls, as I knew you folks would appreciate them. 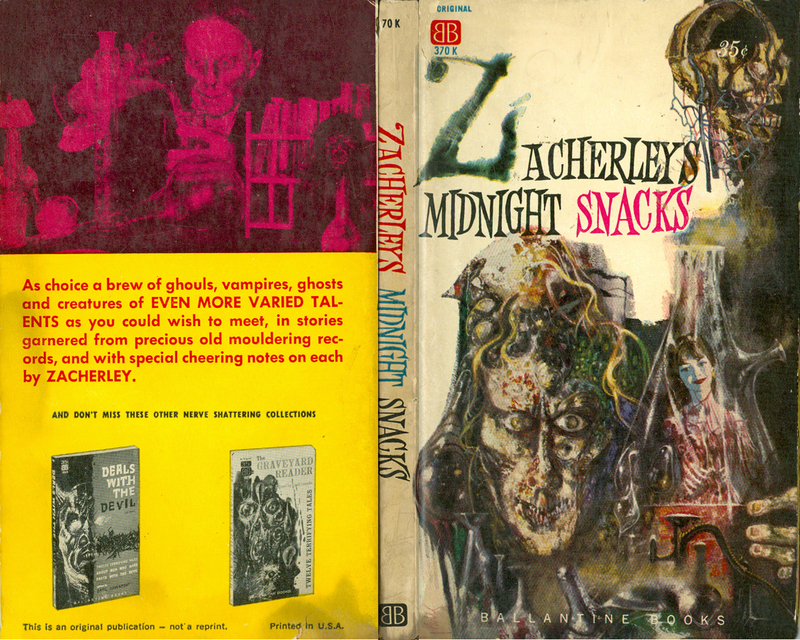 They are two anthologies published in 1960 that were edited by none other than Zacherley himself! Unlike most ghouls, ghosts and monsters, Zacherley is a self-made tradition. 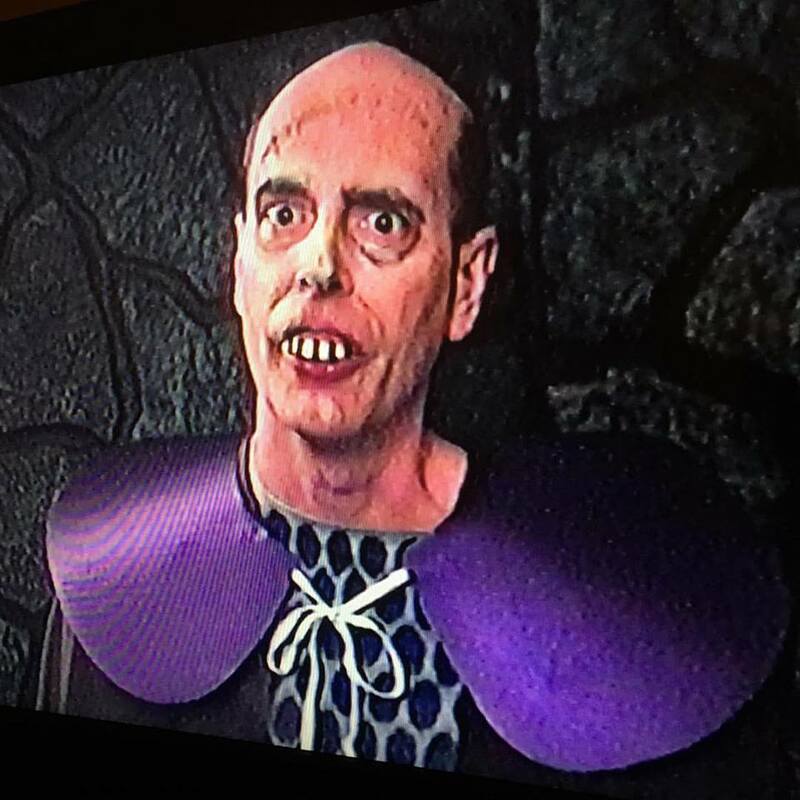 He is alleged to have been conceived in the mountains of Transylvania, reared with werewolves and schooled at the Transylvanian Technical College of Poltergeistery. 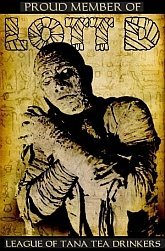 A creative figure of the world of shrieks and shrouds, he talks on equal terms with the known hoots and haunts of antiquity. 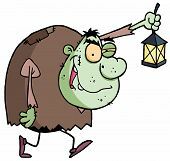 But his urbane laughter and dexterous daring-do, whether in the haunted vaults or vaunted halls of legend, always put him a step ahead of routine monsters. To grasp fully the ephemeral mystery of Zacherley, study this book and then watch his ghost-to-ghost tv program in New York on WOR TV, and in Los Angeles on KHJ TV (both channel 9). 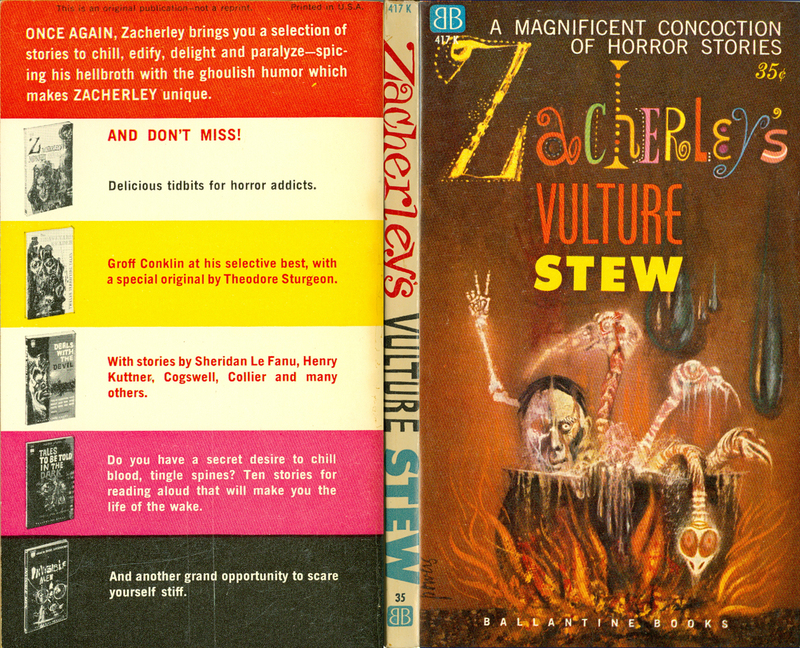 For those who know, Zacherley represents the triumph of artful laughter and keen satire over ancient films peopled with the cinema's most contrived spooks and nightmares. Whether it is Dracula, Frankenstein or the Hound of the Baskervilles, Zacherley's celluloid magic always triumphs. What a cool intro. I wonder who actually wrote that? To be fair, I believe Zacherley's involvement with this project was probably limited to the brief intros before each story. The curating and collection of said stories, as well as the above introduction, were no doubt done by someone with a publishing background. But I'm glad that this was done, as these are fun collections full of equally fun stories. The stories were all previously published in a variety of pulp magazines including UNKNOWN WORLDS, THE MAGAZINE OF FANTASY AND SCIENCE FICTION, STIRRING SCIENCE STORIES, THRILLING WONDER STORIES, BEYOND, FANTASTIC UNIVERSE, THRILLING WONDER, and AVON SCIENCE FICTION AND FANTASY READER. The artwork on both books is by long time fantasy and science fiction artist Richard M. Powers. I love the fun and whimsical flair to this art. You can see a complete listing of his work, with examples of each, here. According to Wikipedia, during the 1950s and 1960s, he served as an unofficial art director for Ballantine Books, which meant he would have been art director for these two books, too. he was inducted into the Science Fiction Hall of Fame in 2008. Published by Ballantine books with an original cover price of 35 cents, these books are a lot of fun, and still available online (with just a little searching) and well worth the effort. I was going through an old VHS tape this weekend and stumbled across this vintage Vincent Price ad from the 1980s for Nikon camera. It is a wonderfully creepy ad featuring a crawling hand in a haunted mansion, with voiceover from Vincent pitching the Nikon one-touch camera. Good ole Vincent was the pitch man for everything from cameras to cottage cheese and much more. His face was everywhere in the '80s, and it is always a treat when something new pops up like this - now I'm going to have to go through more of my old VHS tapes, who knows what gems are lurking there waiting to be rediscovered? I wrote this one a while back, and since it's Election Day today I just couldn't pass up posting it here. And if you enjoy it, and haven't picked up a copy of my TALES FROM PARTS UNKNOWN collection, now is the perfect time! Ygor looked shocked. “What? Why, that would be against union code, you know that. I could lose my privileges for something like that.” He winked at the dwarf as he popped a handful of grub worms into his mouth. He noticed a blonde in a lab coat a few tables over. She looked up and their eyes locked. He raised an eyebrow and flashed a toothless grin. She quickly looked away, annoyed. The other henchmen turned to see what he was looking at. Mounted on the wall was a television. Onscreen, a man in a crisply pressed suit waved to an enthusiastic crowd, a leering smile plastered on his face. Words scrolled across the bottom of the screen announcing the latest election results. “Even I can’t work for an overlord that evil,” Igor said with a shudder. In this AIP Poe picture, Price plays Julian Markham, a rich nobleman who keeps his insane, disfigured brother Edward (Alister Williamson) locked in a room in his attic. His brother fakes his death and escapes, then goes on a murderous rampage. Also features Christopher Lee as Dr. Neuhartt, who purchases bodies from body snatchers for medical experiments. Directed by Gordon Hessler. This was the first film to feature Price and Christopher Lee together. I had such great response to the October giveaway that I thought I'd do another for November, giving away a fright rags T-shirt and box set of b-movies - every Thanksgiving needs some good turkey, right? This set has 12 of them! Good luck!! My buddies Stephen and Cam from the 4 Letter Nerd podcast asked me if I would participate in an unboxing of the October Loot Crate and Loot Crate DX. I was happy to do so, especially as Stephen and I are not only good friends but also next door neighbors! The 4LN guys came by my place on a Saturday afternoon, and we had a blast shooting this and drinking pumpkin ale. It was the end of an era - and the beginning of a new one. With this issue publisher Dennis Druktennis ended his tenure as publisher of the magazine. it was a bittersweet event, as all his hard work and sacrifice over the years finally paid off and he reached the magic 100 number, which was his personal goal from day one. he handed the reins of the magazine over to current publishers Don and Vicki Smeraldi, who have continued to keep this well oiled machine chugging right along and even breathed some fresh energy into it. For issue #100 I reached out to some of my horror host brethren and got a quote from them to congratulate Dennis on reaching this milestone. Among those I talked to was Zacherley - I called him up at his apartment on a Saturday afternoon. he was relaxing and watching a Yankees baseball game. That was the last time I spoke to Zach, who passed away last week. I'm really glad I was able to include him in this column. He was a true one of a kind. As is Scary monsters Magazine, and here's hoping the next 100 issues are just as monsterific!